ONE is in prison, one is a university professor and the favourite hobby of another is football. They are members of Russia's so-called Golden Horde, who have earned a place in Forbes' first list of Russia's 100 richest people. Loathed by most Russians, [see this website's dossier on the origins of anti-Semitism] who see them as thieves of their natural resources, two thirds of the Golden Horde made their fortunes in minerals and enterprises inherited from the Soviet Union. The combined wealth of Russia's oligarchs is equivalent to one quarter of Russia's GDP; the combined net worth of all US billionaires equates to just 6 per cent of America's GDP. According to Forbes, the glossy publications that track the lives of the world's most successful tycoons, no other city in the world boasts as many billionaires as Moscow. 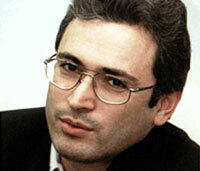 The list, published today, ranks Mikhail Khodorkovsky as Russia's richest man, though he is now languishing in prison and unable to enjoy the fruits of his fortune of $15.2 billion (£8.9 billion). Forbes chose to count his stake in Yukos, the Russian oil behemoth, even though the shares have been frozen by the state pending the outcome of his trial for fraud and theft. If he is found guilty he is likely to be stripped of his fortune. Second in the Forbes list is Britain's favourite Russian, Roman Abramovich, whose $12.5 billion fortune has helped him bankroll Chelsea Football Club. Russia's most eligible bachelor, according to Forbes, is Mikhail Prokhorov, number four on the list with a relatively modest $5.4 billion. Mr Prokhorov, 38, is head of the metals conglomerate Norilsk Nickel, which is based in Siberia. Although his fortune comes from the frozen ground of Russia's north, he is more likely to be seen at parties on the French Riviera. Forbes has also calculated the cost of supporting the lifestyle of a Russian billionaire. "For the private yacht, airplane, property in Moscow, apartment in London, you are looking at a $161 million capital investment," said Pavel Khlebnikov, Editor of the Russian-language edition of Forbes. "Operating expenses are about $9 million, including security services, a driver and maintaining a mistress." Russia's oligarchs came to prominence in 1997 after the country's loans-for-shares auction in which entrepreneurs lent the cash-strapped Government money in exchange for shares in the biggest enterprises. The state could not afford to buy back the shares and was thus stripped of many of its most profitable businesses, largely in the field of natural resources. In a man's world, one Russian woman stands shoulder-to-shoulder with the tycoons. She is Elena Baturina - wife of Yuri Luzhkov, the Mayor of Moscow - whose fortune comes from construction in the capital. Mr Khlebnikov believes that many of Russia's billionaires are already becoming bored with their new-found wealth and high living and exhausted by the chaos of Russia's newly fledged market, and are turning their attention to more philosophical pursuits. Thus, Vladimir Lisin, net worth $4.8 billion, a former steel mill mechanic who now owns a majority stake in the giant Novolipetsk steel mill, has retired from business to run a university course. He is probably the world's richest professor. The secrets of Russia's billionaires are often murkier than their Western counterparts. Mr Khlebnikov believes that many businessmen overestimate their wealth. Outrage in Berlin Conservative German politician claims Jews are "a Race of Perpetrators"
First Russian International Corporate Philanthropic Foundation (of Khodorkovsky and Rothschild): "I am launching the Foundation [First Russian International Corporate Philanthropic Foundation] in London to highlight the international nature of the Foundation's aims and to create an infrastructure from which the next generation of Russia's leaders will emerge."